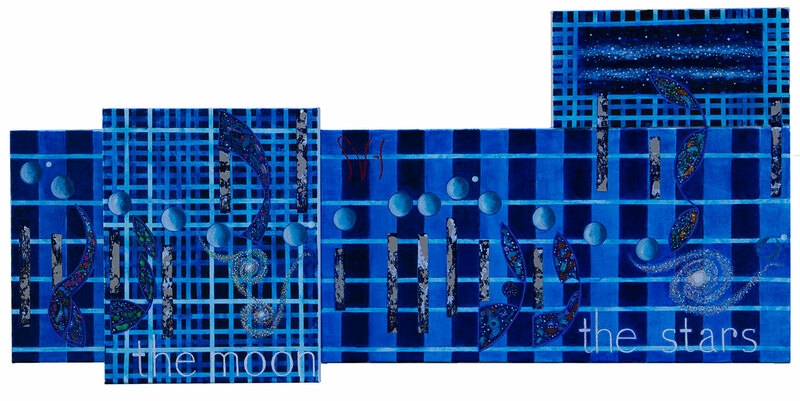 Fly me is compose of four canvases with a length of 40 inches by at most of nineteen inches.This little blue gem, stands out as a special work. The strong dark verticals of the background represent the strong and solid beat of this music song elegantly by Frank Sinatra. Of course all the blues are a statement about the darkness of night and the wonders of dark skies. In this work you seen nebula’s and galaxies and in the upper right top you have a view of our own galaxy, the Milky Way. You see in the flow of the music the drifting across of little planets that float untouched far above the drama of the background. The words ,”the moon, the stars,” say it all and then say so much more. What an amazing treasure a potential buyer will have. We will see if she has the courage to tackle owning this most wonderful work of art, known only to me and now to you. ~ by Scott Von Holzen on 10/16/2014.